If you’re like most folks across Michigan, you’re concerned about the rising cost of public colleges and universities. Or the lack of hands-on training for young people. Or barriers that can prevent workers from finding a decent, family-supporting job in the state. College. Career. Opportunity. These are the issues that are weighing heaviest on the minds of Michigan residents, according to more than 5,000 participants in this year’s Center for Michigan “Getting to Work” public engagement campaign. It’s why the Center is hosting three, star-packed “Solution Summits” this fall that anyone who cares about these critical issues would benefit from attending. The half-day sessions, slated for Grand Rapids, Lansing and Livonia, are can’t-miss opportunities to hear political, education and business leaders, along with top experts, address the most pressing issues identified by Michigan residents and offer policy recommendations that will to improve the fortunes of those who live and work here. Gov. Rick Snyder will address concerns about college costs and job opportunities raised by residents across Michigan in the Center for Michigan’s Community Conversations. Speakers include Gov. Rick Snyder, the presidents of U-M, MSU and Grand Valley State University, and a range of state and national experts, legislators, business and workplace development executives, and front-line college prep counselors. The summits are designed to gather reaction to the Center’s new “Getting to Work: The Michigan Public’s Agenda on Career Navigation, College Affordability and Upward Mobility for Workers” report, which will be released the week of Sept. 14-18. Summit seating is limited so online registration is advised by September 28. A small fee is charged to cover a continental breakfast, lunch, rental space and speaker travel costs. It’s $25 for Bridge Magazine subscribers (Subscriptions to Bridge are free); the fee for non-subscribers is $35. Presidents from three state universities ‒ Mark Schissel of U-M, Lou Anna Simon of MSU and Thomas Haas of Grand Valley ‒ will address residents’ desire that Lansing and state colleges and universities do more to make higher education more affordable. Presented in partnership with WDET Detroit Public Radio, this event focuses on how to improve college, training and career navigation assistance for Michigan’s young people. Speakers include state representatives Amanda Price and Adam Zemke, the governor’s Education Policy Advisor Karen McPhee, experts from the Michigan College Access Network, Michigan School Counselor Association, current and former College Advising Corps, and regional and national leaders in college and career navigation. The event runs from 9 a.m.-1 p.m., at Schoolcraft College’s VistaTech Center, Livonia. REGISTER HERE. Held in partnership with Talent 2025, this summit explores ideas to improve Michigan residents’ opportunity for upward mobility and economic prosperity. 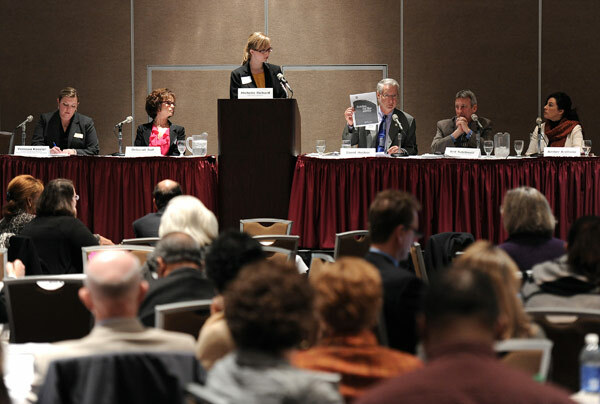 Expert panelists include representatives from the Corporation for a Skilled Workforce, the W.K. Kellogg Foundation, the Michigan Department of Health and Human Services, Goodwill Industries of Grand Rapids, Butterball Farms, DeWys Manufacturing, Advanced Manufacturing Partnership, Michigan’s Talent Investment Agency and Kent Career Tech Center. The event runs from 8:45 a.m.-12:30 pm, at Grand Valley’s Eberhard Center, Grand Rapids. REGISTER HERE. Held in partnership with Public Sector Consultants, this event is for anyone concerned about the rising cost of college and student debt loads, with a focus on improving college affordability in Michigan. Speakers include Governor Rick Snyder, University of Michigan president Dr. Mark Schlissel, Michigan State University president Dr. Lou Anna K. Simon, Grand Valley State University president Dr. Thomas Haas, business and political leaders and national and state education leaders, including from Michigan’s community colleges. The event runs from 8:30 am-2 pm at the Radisson Lansing hotel, Lansing. REGISTER HERE. The fall summits grow out of one of the largest in-depth citizen surveys on these issues ever conducted in Michigan. The Center’s public engagement campaign included nearly 150 Community Conversations, statewide polls, and targeted online surveys of high school and college students, educators, business owners, and higher education consumers. “Michigan residents have serious concerns about the often-foggy path to personal prosperity in Michigan,” said John Bebow, CEO, Center for Michigan. Four year college and University costs are no longer affordable. Majors that lead nowhere still abound and debt for most is not possible to pay back. Have a truth in lending agreement signed when they start and just maybe it will shock a few into reality. Tell them all the facts and the truth about placement when done and what they will owe. R.L. The number of Michigan kids attending Michigan's universities is at least double what it was in the 1960s. Logically, because of increased enrollment, tax payer contribution to higher education should be at least double what it was then, adjusted for inflation and the increase and enrollment, tax payer contribution to higher education should be 15 times what it was in 1965. Tax payer contribution isn't anywhere close to this number and that's why students now pay 80% of the cost of their higher education when in 1965 they only paid 20%. Will these be like the highly recommended “Early Childhood: Shifting Mindsets” at CMU back in June, never to be heard of again. I hope not. I hope we hear some highlights, new/innovative ideas and not just the tried and true spend more of other people's money. I wonder how those who have graduated and paid back any loans did it, I would like to hear how and why they were successful. It looks like just an exercise for politicians to pretend they place a big priority on education and when it is over nobody can recall what it was about, sort of like that confab at the Grand Hotel every year with a lot of empty speeches. A session on college afffordability that only includes universities and none of our community college voices? Sounds like a pretty significant oversight to me. Any panel including Grand Valley State University that is addressing financial issues for students is a sham . A first generation college student from an impoverished family was loaned 60,000 dollars by GVSU for an undergraduate degree in an environmental career path that has lead to no employment in his field! He is financially ruined by this ! Grand Valley has no moral compas when it comes to money! GVSU and all state schools should be investigated for such destructive userous financial practice which I suspect is widespread! Why would you hold these events on weekday mornings? Many of the people who should be attending these forums, like high school and college students, and their working parents, will not be able to attend. These should be held during the evening. What if we take a different perspective on these three topics, what if we look at them as steps to a final purpose? Would that change how we address each step? If the purpose of an advanced education is longer term employment and financial success does this change how we look at each. When we look at that career navigation does it matter what type of education to focus on? Is a political science degree vs. an engineering degree affecting the navigation? Does the degree matter? If we consider mobility does the degree matter? When we look at upward mobility is that the right consideration if we are interested in long-term prosperity? Can prosperity happen without moving? Can an engineer grow their value to an employer by building their expertise without having to move and with that expertise can they become more valuable to the employer [increasing pay]? Is that true of the political science degree? If we consider that it is the long-term employment how might that impact financing the education? If a student earns an engineering degree, starting salary +$60,000, if it is a political science degree, might it be +$30,000. If the average career salaries double how to does that impact capacity to pay down loads? Does that effect educational funding? If the universities adjust to the demands of long-term employment do they adjust the nature of the schools, shift the staffing and facility uses accordingly, does that impact educational cost [can the structure be flatter, lower cost]? What if the reality of a global economy is one based on technology, information and idea sharing, predominated by a core language [numbers, computer, English], what if a person can stay in one geographic local and succeed globally? Could we be focused too much on the past, how up mobility was tied to financial success, tied to pyramid structured organizations, how knowledge resided in a small group of people, how access to information was geographically limited, etc.? Should we be driven by trying to address the past, should we be trying to see how the past is relevant to the future, should we be trying to address the future? Maybe we should be having a bottom up conversation about advanced education with those preparing their children for the future? Trying to take a slightly different perspective from what the ‘experts’ seem to be saying.